What's Up New Haven: New Haven County: Jennel Garcia, The GiGi Sisters and Sarah Barrios Perform at The Space! 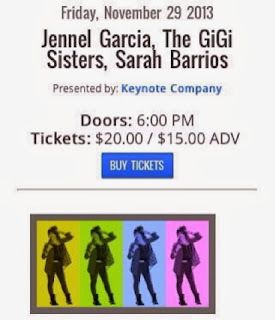 New Haven County: Jennel Garcia, The GiGi Sisters and Sarah Barrios Perform at The Space! Looking for a great evening of live music? Then mark your calendars for 6pm on Friday, November 29th for a cool show at The Space in Hamden. Yes, I know Hamden is not New Haven, but it's a hop away from our beloved city. Close enough! The Space is an all ages music & arts venue located near New Haven and is accessible using CTTransit bus line*. Come support CT native Sarah Barrios as well as former X-Factor contestant Jennel Garcia and The GiGi Sisters! Tickets are $15 in advance (purchase online here) or $20 at the door. All three artists offer sultry, powerful performances. If you don't believe me, just check them out on YouTube. Throw on your cutest "night out" outfit, grab your friends and head on over to The Space on November 29th! *The Space is approx. 15 minutes by car from downtown New Haven, or you can get there by taking the "O" bus line to Treadwell St. and Martin Terrace in Hamden.